Looking for the Wednesday Wandering? Page back one and enjoy a behind the scenes look at the process of translation. Then join me and Alan as we venture into realms twisted, weird, and utterly wonderful. JANE: When we were discussing the various genres of SF and Fantasy a few months ago, I mentioned that a writer I particularly enjoyed was Clifford D. Simak. I was delighted when you said that you liked him too. PInkness, Ghosts, Neanderthals, and Goblins, oh, my! ALAN: Oh yes – one of my favourite writers. He seems largely forgotten now, but in his day he was a prolific and popular author. He made the mistake of dying just a few days before Robert Heinlein died and, in the fallout from that massive event, he passed largely unnoticed. I’m not even sure if his books are still in print. If not, they certainly should be. JANE: I wanted to talk about Simak when we first mentioned him, but I got distracted and went off on a tangent. ALAN: Isn’t that what it’s all about? I encountered Simak’s work back before I paid a lot of attention to who wrote the books I was reading. Books were their own wonderful things and the authors were incidental. Simak was the author who changed that for me. ALAN: Yes indeed. Time travel stories are my favourite stories. JANE: All right, climb into the cabinet and swirl back the dials. It’s summer, sometime probably in the late 1970’s. I’m in my early teens and have discovered SF and F. Every week or so, my mom takes me and my siblings to the public library. There, we are permitted to take out as many books as we can carry. Because of this weight restriction, I have abandoned what was then called the “Children’s” section with its big, bulky hardbacks and gravitated toward the wire paperback racks. It is on one of these that I first encounter the works of Clifford Simak. After a while, I find myself deliberately searching for more. I finally run out of paperbacks. Then it hits me. This is a library! That means it works like the school library! Up until then, I think I’d considered the public library as more a holiday place, not operating by library rules, if that makes any sense. I browsed, but never systematically searched. But now, my desire to read more Simak is heating my blood. I check the card catalog. I found Simak’s name, and bravely crossed the invisible line into the Adult stacks. I half-expected someone to pull me back from Forbidden Lands. ALAN: I vividly remember my first excursion into the Adult Library. I think that for people like you and me, it’s a coming of age ritual, a rite of passage. Do you recall any Simak titles from your exploration of the Forbidden Lands? JANE: I can’t say precisely which was my first, but I can remember an early favorite: The Goblin Reservation. It had everything: time travel, space travel, inventive aliens, goblins and their fey ilk, Neanderthals, and ghosts. It was a murder mystery, a tale of political intrigue, and, for those who insist that SF teaches nothing, it was also the first place I encountered the theory that Shakespeare did not write the plays. I still enjoy it greatly. I could go on with more titles, but maybe I should turn off my time machine and give you a turn. I was about twelve or thirteen. It was summer and my parents and I were on holiday at the seaside. 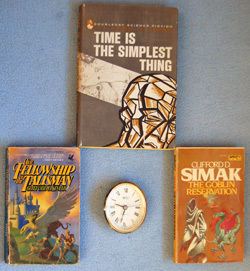 I found Time Is the Simplest Thing in a pile of second hand paperbacks. I’d never heard of Clifford Simak, but the blurb attracted me and so I bought the book. I think it cost me sixpence, and it turned out to be the best sixpence I ever spent. I read the story with jaw-dropping amazement. JANE: I haven’t read that one in years. Can you remind me a bit about the plot? ALAN: Indeed I can. Earth has turned its back on space travel. The best they’ve ever managed is to send the minds of brave people out to the stars while their bodies remain on Earth. Shepherd Blaine is one such explorer. But on his latest trip, he encounters a telepathic alien which he describes as a pinkness. “Hi, pal!” it yells in his head. “I change with you my mind.” And it does. Blaine returns to his body with a bit of the pinkness in him. He immediately goes on the run – previous explorers to whom something like this has happened have been arrested and have vanished from view. They have been contaminated and they must be dealt with. JANE: I remember! As soon as you said “pinkness” that did it. I bet you loved it. ALAN: I was completely absorbed in the story. So much so that I never registered that my aunt and uncle and cousin had joined us for the day. Eventually it dawned on me that my cousin was talking to me. “Science fiction,” I mumbled, not lifting my eyes from the page. There was only one possible answer. “This chap,” I said, showing him the cover. JANE: Have you ever read Time is the Simplest Thing again? ALAN: I read the book again as an adult and I got a lot more out of it the second time around. It was still a gripping can’t-put-the-book-down story but this time round I realised it was an allegory about racial intolerance in America. People with paranormal abilities, those with a pinkness in their mind, are feared and ostracised by society. As Blaine runs and hides in the back blocks of America, the story fills with images of rusty, decaying small towns, angry mobs and the dangling corpses of lynching victims. This is a common theme with Simak – again and again and again his novels tell us that we are all in this together and that superficial things like a pinkness in the mind really don’t matter in the grand scheme of things. And so all his books have the strangest companions working together in harmony. The book you mentioned, The Goblin Reservation, is quite typical in this regard. JANE: Absolutely! But the best thing about Simak is that he never lectures. I think one of the things I love the most about his works – and that I think has had a huge influence on what I choose to write – is how size or shape or species are not an issue in what makes for friendship or alliances. Even when he latches onto what for other writers might become a really conventional trope, this emphasis on character connection makes the story special. In his Fantasy novel, The Fellowship of the Talisman, what could be a typical ho-hum quest story becomes special because of the extraordinary group which ends up looking for a talisman that may or may not exist. Have you read this one? JANE: Sigh… The members of the quest start out seeming rather typical: Duncan, a young knight and his childhood best friend, Conrad, who is a burly warrior. Then there’s a wardog, Tiny, and a warhorse, Daniel, and a little donkey named Beauty. Mind you, none of the animals are magical or can talk, but that doesn’t matter. They’re members of the Fellowship. Along the way Duncan’s group becomes even more diverse… But I don’t want to spoil the story by going into too much detail. Suffice to say that they become a group so varied and interesting as to make a combination of humans, hobbits, elves, and dwarves seem positively conventional. ALAN: Simak had a lot of strings to his literary bow. Let’s look at some aspects of his work next week. This entry was posted on April 24, 2014 at 1:00 am and is filed under Thursday Tangents. You can follow any responses to this entry through the RSS 2.0 feed. You can leave a response, or trackback from your own site. As for Simak (who I discovered and devoured once I got past the Cerberus guarding the adult library cards), a lot of his work is still (or rather back) in print in the UK as part of Gollancz’ SF Masterworks line, and most of his work is available in e-format from them as well (which reminds me I have to go see if they’ve released the e-dition of City yet…). Simak is not an author I’ve read before. I may have to hit the library and/or the used book store this weekend. I’m not sure when I first started venturing into the adult section of the library. I suspect that I went to the non-fiction section first, probably looking for books about dinosaurs (that’s the 560’s, in the Dewey decimal system). So many “golden age” authors are unknown to today’s readers. Thanks for reminding us of this one. Even now, I still have a few of his books here that I haven’t read yet, but will. I always looked forward to seeing his name on the newsstand paperback rack. Tied with City as my favourite of his novels. Not to be confused with Jack Finney’s 1970 novel of the same name.